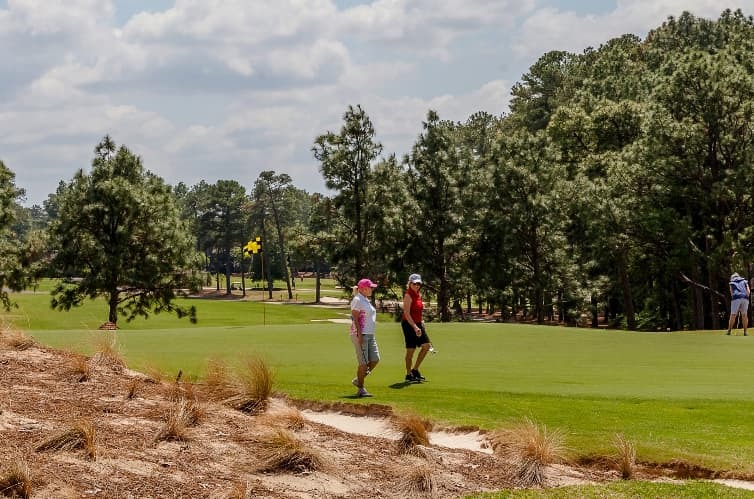 Gil Hanse: The crossbunker on the 9th hole is inspired by Hell’s Half Acre at Pine Valley. It’s always been a fascinating part of a par-5 design. Jim Wagner and I have always embraced that. The way we positioned it here, it actually sits nicely into an up-slope. You’ve got all the room in the world to hit a tee ball and get as close to it as possible and then you’re looking at anywhere between a 90- to 100-yard carry over the top of it. But what we did, which is a slight twist on the Hell’s Half Acre, is we angled it so the carry is actually angled so that it’s shorter on the left-hand side and longer on the right-hand side. So, the golfer who challenges the longer carry down the right-hand side will actually be rewarded with a better angle into the green — you won’t have to deal with the greenside bunker – dealing primarily instead with contours and ground features in order to challenge it. The golfer who takes the shorter carry down the left-hand side now has a direct shot into the green, but the left-hand fronting bunker is definitely in their way. So, it’s a strategic component for the tee shot, the second shot, but also setting yourself up for the best potential third shot into the green. Gil Hanse just walked Pinehurst No. 4. We went with him…and took notes.